It’s fine. You can write about me if you like. You’ll probably get it wrong. But as long as you don’t insult me – and by that I mean say unkind things about my size, age or intelligence [I prefer to cover this myself] – you can write about me. If I were to review you, I’d most likely point out how wrong you were, while trying not to insult your intelligence. But I can’t see how writing about me, the Swede, if you are not one yourself, can be wrong, or that it should be forbidden. I wondered a bit where all this upset over cultural appropriation went while I was away. It was all over the place as I left, and I was in the very odd position of having to agree with Lionel Shriver; something I generally take steps to avoid. The Guardian printed her whole Australian speech from a few weeks ago, and I could find fault with nothing. How can we not ‘appropriate’ someone else’s culture? It’s everywhere, and if I were to write a novel, say, it’d be pretty boring if it only featured 60-something females from Sweden. Never mind the sombreros. If we must write only about what we ourselves are, I need to leave the men alone. I don’t know what it’s like to be a man. If I tried, he might be insulted. Or an 85-year-old Englishwoman. Or just about anyone. It is, of course, possible to outlaw all this. There could be a legal requirement not to write about other people, not to make things up. I hope we never get there, but the way things are going it wouldn’t surprise me in the least. As for asking permission first; how can you find everyone who owns a particular kind of culture? What if they don’t agree – with each other – and some say yes and others say no? I believe I actually complained about someone getting things wrong, and having missed the point of the life of a Swede like me, earlier this year. I didn’t feel the person responsible for the rather attractive book cover in question shouldn’t have done it. I just would have preferred my ‘correct’ view of what things looked like to have been used. In fact, Seacrow Island is a good example of this thorny issue, because I do have strong feelings and opinions on the matter. But I really don’t feel that ‘foreigners’ should leave my childhood dream alone. It’s there for anyone to use. And if you are of an age to have been around when the Famous Five were written, I apologise for thinking everyone in England was like that. And then there’s the belief that Wales is in England. We can all be so very wrong about so much. But many of us mean well. While I was away a book arrived in the post. It’s about Prince George and his potty-training. It’s a cute book and a cute subject, and I can see how potty-training is a good topic for young readers to become enthused about. But it suddenly struck me that this was about the supposed problems of getting used to a potty, as experienced by a real person. A Prince, yes, but still a small child with the right to privacy. I begin to see the pattern now. 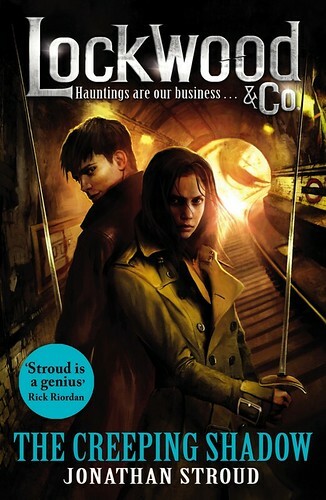 Jonathan Stroud’s Lockwood is going somewhere, rather than each individual book being an adventure on its own. And I don’t know how he’s going to do it, but I wonder if I can guess a little at what must happen. Who the bad guys are, and I don’t mean just the dead bad guys who upset the balance of normal life. In this fourth instalment of the ghost hunting series, you sense that there might be a bigger picture, some plan as yet only hinted at. And that’s exciting. Lucy and the others have plenty of individual ghost hunting adventures in The Creeping Shadow. More than in the past, I believe, and the reader sits there wondering if ‘this one’ will be the biggie. The one that determines how things will end. Or it could be the next one. Plenty of bad ghosts in here. And is everyone who they seem to be? Listening to Jonathan in Gothenburg last week, I at least learned how old – or rather, quite how young – Lucy and Lockwood & Co are. It leaves you amazed at how they manage. There is more tension between our two main characters, with some innocent-ish innuendo. Are they? Will they? If you’ve not started yet, do so before it’s too late. Before they get you. Ghost-touch is no joke. You can learn new things, even in the short 80 pages of a Barrington Stokes book. Here is Tony Bradman with another brief Shakespeare tale. This time it’s set while Will lives at home with his parents and siblings, going to school and getting bored and skiving off to go and see the theatre company come all the way from London. He meets Mr Burbage, and although we can’t know what actually happened back then, it feels like true history is taking shape as Will gets to know the travelling actors, and meets ‘real’ people. The way he falls in love with the theatre is truly inspiring, and feels like it could have happened that way, and it would explain all those famous dramas we still have to enjoy. The Shakespeare parents have their troubles, and life isn’t always easy or safe. Will sees something odd when he’s out and about, and feels it needs dealing with, just in case. Sensibly, he speaks to the older generation, and something can be worked out. 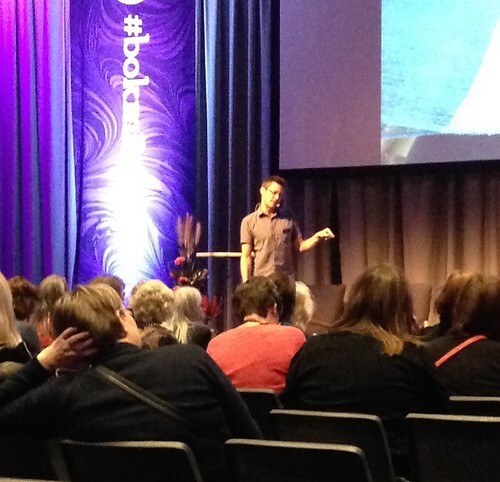 Jonathan Stroud had been in Gothenburg before. 11 years ago, he reckoned, which is true, as that’s when we met him the first time. Then he had his Bartimaeus trilogy to talk about, and now it’s Lockwood. On Thursday morning Jonathan did a short event with his publisher, and he only had to warn her once that she must be careful with spoilers. I’m glad I was already past that bit, so it didn’t upset me. 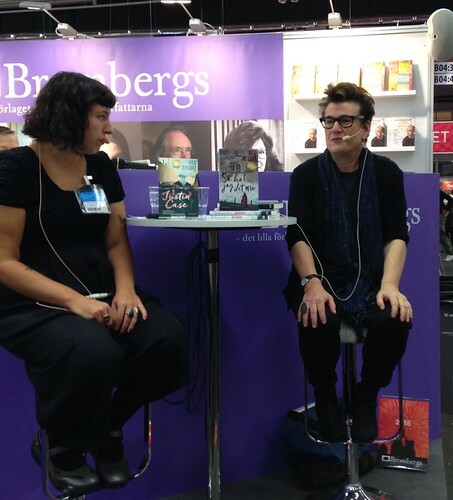 I’ve been reading the 4th Lockwood all week (and the reason I’m not done yet is not because I’m slow, but simply that there hasn’t been enough time in the week) and it has been just the right background for a bookish few days at the Gothenburg book fair. Everyone is impressed by his extensive research (this is fiction, folks!) into ghosts and the weapons he gives his characters in their fight against the ghosts. Poltergeists are – sort of – real, but most of the rest he obviously made up. 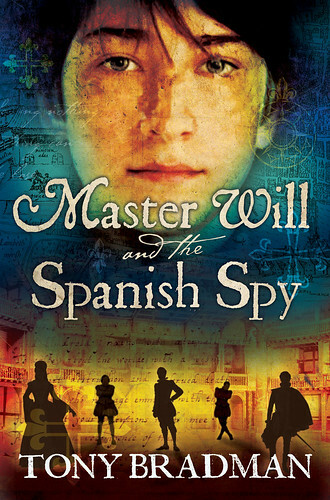 Lockwood began when Jonathan wrote a short introduction, featuring a boy and a girl outside a door, and he wanted to find out who they were and what they were about to do. Lockwood and Lucy and George emerged from that short opening. The reason he uses – an alternative – London as the setting for a fantasy is because it’s more realistic and exciting in a real place. He doesn’t know much, but builds things up slowly. The agencies in the books are growing increasingly corrupt, so he made the ghost hunters young because they are more open than adults. Jonathan compared the work the young agents do on a nightly basis with our own everyday tasks that we just have to do, whether we want to or not. He feels that by implying things and being sparing with details, you have a more powerful story. 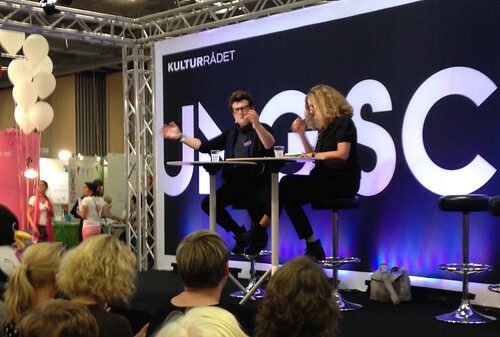 In his event with Lotta Olsson, he and scary author Mats Strandberg discussed the difference between horror and terror. It could be that horror is more for children, while terror works better for adults. Mats, who has been inspired by Harry Potter [the films…] described his new book as being a bit like The Walking Dead, set on the ferry to Finland. (Which sounds pretty terrifying, if you ask me.) And apparently in his next book Mats is even scaring himself. Jonathan believes in suspense, which is why he doesn’t want to show his ghosts too soon. You will be more frightened by not knowing what’s coming. There’s the bump in the night, versus machine guns. Mats said that in terror it is generally the underdog who fares best. Asked by Lotta how the easy access to violent [real] videos for even quite small children will affect future writing, Mats hopes that empathy can save the world. Freedom to Think is a campaign Jonathan is involved in, which wants to give our far too busy children some time to themselves, when they can simply sit and do nothing; dream up new ideas and maybe learn the skills to be an author or to do other creative things. Not to be ferried round by parents to ever more activities. Lotta wondered if Lucy was meant to be the main character in Lockwood, and Jonathan felt that the fact she is flawed, brave, and has anxieties, makes her a useful and very suitable hero, and why he discovered that Lockwood was no good in that role. Finding your voice is the best thing. Asked by someone in the audience for their favourite writers, Mats confessed to being a Stephen King fan, while Jonathan likes M R James and his ‘short and nasty’ stories. Jonathan is currently writing the fifth and last Lockwood novel, which is nervous work. But he finds that the scary bits make the jokes better. I’d forgotten how nicely Irish Chris Haughton sounds. I wasn’t surprised that this wonderful picture books author and illustrator had been invited to the Gothenburg book fair. Swedes love their picture books, after all. But they’d added another aspect to Chris, by calling his event something like Fair Trade Picture Creator, and that is even more of a Swedish thing. So I don’t know if the ladies flocked to his event because they like sweet picture books, or they enjoy beautiful rugs, or they just like nice Irishmen. Anyway, Chris started off his event talking about his picture books, with a slide show, and reading selected bits from a couple of books, showing us how he had developed his ideas. The young Chris had gone from being told he could work as a graphic designer, to enjoying making caricatures, and then discovering the use of computers at college. The next stage was collaborating with The People Tree, designing various goods for them and being paid in t-shirts, which Chris liked. He travelled in India, and saw things he found interesting, and only got on to the rugs by accident when being shown yarn dyeing and felt he had to be polite about it. He quickly worked out where the rug makers were going wrong; making good quality rugs depicting the Manchester United logo. It was this that made him come up with attractive alternatives. Chris’s next venture was making an app called Hat Monkey. This is for young children to do fun things, like dancing and singing. Great pictures as with all his stuff. For school visits Chris has put together a shape kit, which allows young children to play with his characteristic shapes and colours, making new pictures every time. As well as having a display of his rugs and some dolls down on the market stall level, there were books for signing outside. Amazingly all his picture books have been translated into Swedish, and the audience clustered around, eagerly awaiting a doodle or two in each book. I’d have liked to linger, but had another event to run to, so left Chris to ‘his’ ladies. 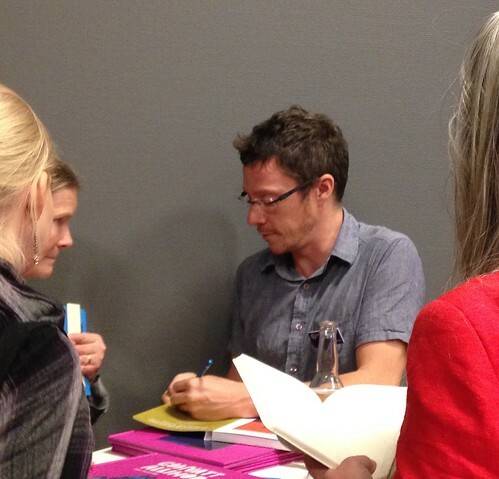 You might remember that Meg Rosoff left me in the corridor on Thursday afternoon. I was still there when she woke up on Friday morning. Or so I tried to claim. I had returned to the same spot, sorting out my plans for the day, when Meg came up and asked if I’d come for coffee with her. On the understanding I’d not actually have to have any coffee, I agreed, and that’s how I ended up slurping my own pink blueberry yoghurt drink after all. Meg had one as well, and also coffee (Swedish coffee, where you don’t get to choose what kind) to set her up for the day. We talked about amusement parks, and nearly falling off carousels, and I recommended Liseberg [across the road] if she wanted a walk. Anyway, it turned out Meg had even more mini-events to appear at than I’d been told about, so I attempted to steer us towards the Brombergs stall, except in the end Meg did better than me. Oh well. It’s amazing how at a fair this size, with thousands and thousands of visitors you ever accidentally find people you know. As I was making my way to see Chris Haughton, my attention was caught – with some difficulty – by the New Librarian, who was standing there eating lunch with Pizzabella and School Friend. So we chatted over their Thai food, until it was time for me to eat my own lunch during Chris’s event. 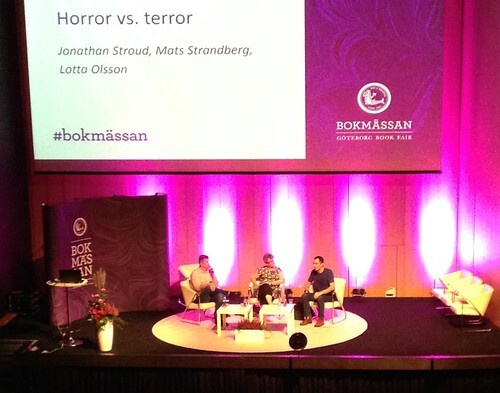 My next event was 45 minutes on horror with Jonathan Stroud and Mats Strandberg talking to Lotta Olsson. And from there I ran to the stage where Meg was appearing, again, and where I’d arranged to meet both School Friend and Pippi. Failed to see School Friend, even with the help of the New Librarian and Pizzabella, who both passed by individually, and who both failed to find their mother. Pippi turned up and we chatted until it was time for me to force a couple of signed books from Meg. At this point School Friend materialised, but when offered the opportunity of meeting Meg she vanished, claiming she had another event to queue for, so in the end Meg only got to say hello to Pippi, who then insisted on buying me tea. And a kanelbulle. I just might have noticed Sven Nordqvist, of Findus fame, walk past. But on the whole I don’t recognise Swedish celebrities. I decided that gossiping was more important than a third Jonathan Stroud event, and when we were done I sent Pippi on her way to look at books and things, while I chased Jonathan for a signature, but missed him. I went to pick up my suitcase from Miss Vet’s, called in at a bookshop on the way to the station (because I’d not had enough, and because the fair didn’t have the book I was after), and caught a train to go and spend the weekend with School Friend. And that is where I am now. It was really very interesting. I may not know too much about maths and physics, but that doesn’t mean an event where people who do know about these things and talk about them, can’t be fascinating. 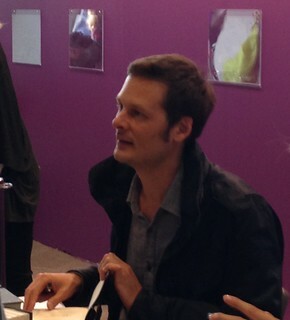 Christophe Galfard and Ulf Danielsson spoke to Karin Bojs about the universe, last thing on Thursday at the book fair. Christophe is famous for having done his PhD with Stephen Hawking, but they were at pains to point out that Ulf had studied with David Gross of Nobel fame, and he is now Professor at the University of Uppsala. Words like theoretical physics and string theory always have entertainment value. Apparently it was ‘quite easy’ to become a disciple of Stephen Hawking. You just turn up as sober as possible, the day after the May Ball in Cambridge, and you talk to the people there and decide who you like best. It was hard work once he got in, though, but also good because in such illustrious company you get to meet the greatest names in the business. You have to ‘think the unthinkable’ to get ahead. Ulf also worked hard, and he once carried Stephen Hawking’s wheelchair. It was heavy. During his time working for his PhD he also became a father, while Christophe said he didn’t, or at least not that he knows of. A bit risqué, perhaps. David Gross insisted Ulf had to learn how to keep his papers in order, and Christophe remembered the time Stephen’s computer voice broke as he was about to talk to his peers, and first year Christophe had to do the talking in his place. 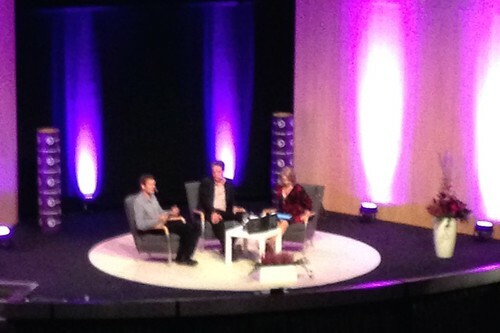 The first book for Christophe was George’s Secret Key to the Universe, which he wrote with Stephen and Lucy Hawking. He said the name helps sales. It’s a story everyone can understand. He is interested in what we don’t know, but also what we don’t know we don’t know. Christophe no longer works with research, but writes full time. He explained why we can’t fly, as well as why we don’t sink through the chairs we sit on. Something to do with quantum physics. And there’s some string theory at the end of his new book, The Universe in Your Hand. As a professor Ulf has other work to do, but gets his writing in at night on the principle that a little will eventually become a book. He used words like dark matter, dark energy and a Star Wars-y title (Mörkret vid tidens ände), but also has thoughts on geography. His new book, Vårt klot så ömkligt litet, is about Earth and how we are no different from stone age people. And he’s flying back to Uppsala. The bad news from Christophe is that the Sun will die. And if only the dinosaurs had had a university, they might have learned about theoretical physics and done something about becoming extinct. Not sure if this had any bearing on his trilogy on climate for children. He feels it’s important. As I said, this was really very interesting. Afterwards I hung around at the signing, just so I could walk up to Christophe and say hello and tell him we’d met before, and that I wasn’t buying his book. And ‘does he really speak Swedish?’ A little, it seems. Who’d have thought?